Your parents always told you, remember ‘please and thank you’. Well, it turns out it isn’t just for the sake of others and good manners, but its also good for your health, your business, and your social media efforts. For a long time we have known that saying thank you strengthens relationships, improves mood, and contributes positively to our own health by reducing stress. In a study done this year, researchers Adam Gant and Francesca Gino looked at the effect of a thank you on the person being thanked. Specifically, they wanted to see if it motivated them to help more or not and then determine if that is just because it makes them feel good or if it is something else. In the first round of the study, participants were asked to help a fictional person. Half received a thank you and a request for further help, while the other half received a neutral reply also requesting further help. 32% of the people receiving the neutral response were willing to give extra help. Of those that received a thank you, 66% were willing to give extra help. In the rest of the experiment they examined why this was the case. What they found was that people weren’t motivated by thanks because a boost to the self-esteem or because they felt better, but because they appreciated being needed and socially valued. Those feelings of social value help people get over factors that would otherwise prevent them from helping. Even more exciting is that not only does saying thank you motivate people to help you more later, but it also makes them more willing to help others. When a person was thanked in a previous interaction, they were more willing to help another person who asked for something. In fact, those who weren’t thanked helped another person 25% of the time, while those thanked helped 55% of the time. Just thanking someone makes us a more helpful society! 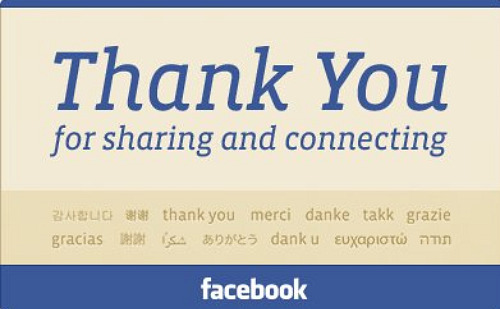 Not only is thanking people in life good for your health and the feeling of belonging for the other person, it can also help your social media efforts. The same principals are at work online, in fact the first part of this study was done via email. For example, it is very important to thank those that ReTweet your posts on Twitter, comment on posts, interact with you on Facebook, or otherwise participate in what you are offering online. Not only does it make them more likely to do it again, it gives them those feelings of social belonging that motivates reciprocity and helps to build a stronger and more active network. Remember the pleases and thank you’s, even online! Science says it makes life better and you can’t argue with that. Salty Waffle has much to give thanks for, most importantly all of you. Thanks for reading, your tweets, comments, questions, and just plain spending time with us!